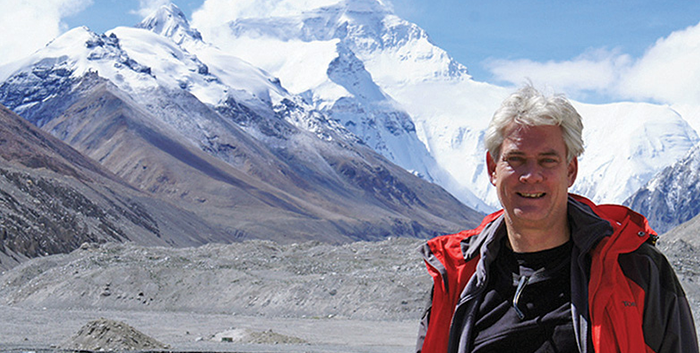 As we begin the 2018 Academic year, I am honored to be taking on my second five-year term as Head of the Department of Earth, Atmospheric and Planetary Sciences. In addition to continuing to support EAPS faculty and students and to build the Department’s academic strength, I look forward to leading EAPS through MIT’s recently approved $60-70M capital improvement and space renovation plan for our department. I am pleased to announce that, after many years of discussion, EAPS is now poised to get 20,000 square feet of new program space, and MIT leadership has approved major infrastructure repairs to the Green Building. Our vision is to build an “Earth and Environment” pavilion to provide a new entrance to the Green Building, with teaching, meeting, event, and study space. This will not only give EAPS research greater visibility—for instance, to students from all over campus who take classes in 54-100—but it will also promote engagement with MIT’s Environmental Solutions Initiative, which will be co-located with EAPS. At the same time, we will gain much needed new lab space in Building 4, enabling us to recruit faculty and students whose experimental research requires state of the art wet labs. The Pavilion and laboratory footprint in Building 4 will not only provide high quality program space but also stimulate cross-campus collaboration and catalyze new synergies in our research and education programs. Altogether, we are expecting this to be a game-changer for EAPS. Now we must roll up our sleeves and raise $30M to turn our vision into reality. This is a formidable challenge, but one I readily embrace. I am committed to seeing this blueprint for EAPS future to fruition, and am confident that together we can meet the goal. I am deeply grateful to Neil Pappalardo and Neil Rasmussen, leading members of the EAPS Visiting Committee, for their advocacy and early philanthropic support. Meanwhile, the EAPS community continues to change, with new faculty, staff, and students joining us this year and next. Over the summer, EAPS appointed three outstanding new faculty members: Dr. Brent Minchew, joining our Geophysics group in January 2018, and MIT alums Dr. Julien de Wit, PhD ’14 (XII) and Dr. Katherine de Kleer ’09 (VIII, XVIII), who will be joining our Planetary Sciences group in July 2018 and July 2019, respectively. We are also very pleased to welcome 29 graduate students this year, along with EAPS HQ staff Senior Finance Officer Natalie Liang and Academic Administrator Megan Jordan, replacing Mark Pendleton and Vicki McKenna who have both retired after many years of dedicated service to EAPS and MIT. EAPS Planetary Sciences has been in the news lately with key contributions to the exciting discovery of the TRAPPIST-1 planetary system which dominated the headlines last spring, and with EAPS faculty and alumnae taking leading roles in NASA missions from New Horizons to OSIRIS-REx, and more recently the Lucy and Psyche missions. 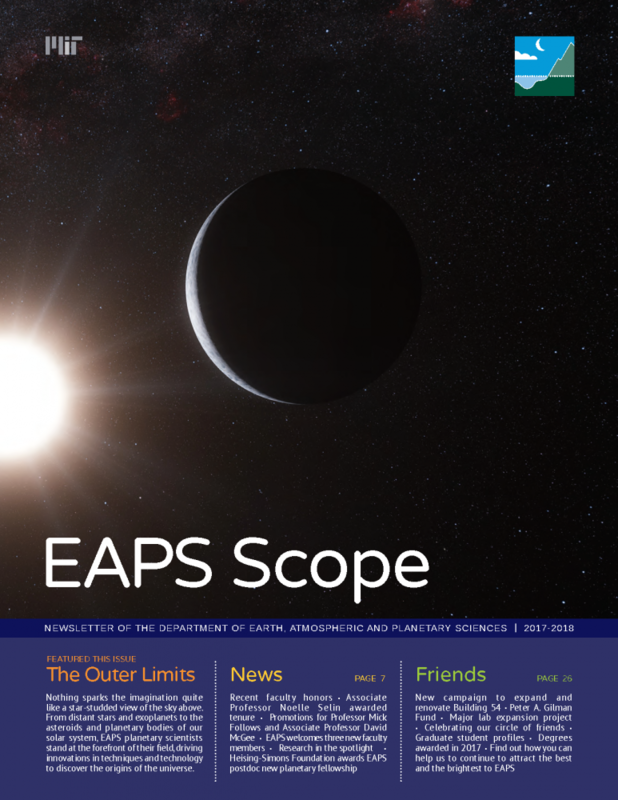 I hope you will enjoy reading about our progress in this planetary edition of EAPS Scope. With the recent arrival of 51 Pegasi b Postdoctoral fellow Dr. Jason Dittman, and two dynamic young faculty members about to join our planetary sciences group, we are confident that EAPS will continue to thrive and lead in this field for decades to come. Thank you for your ongoing support and encouragement, and please do not hesitate to contact me for further information about EAPS and our plans for the future.